Annual event helps farmers, artisans and laborers around the world. 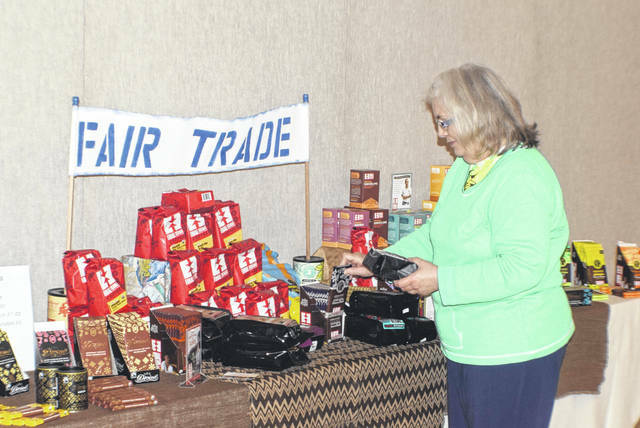 Deb Parker looks over some chocolate and coffee at the Fair Trade Sale at St. Joseph Church Parish Life Center in Wapakoneta. WAPAKONETA — The Petersburg Parishes in Wapakoneta hosted a Fair Trade Sale over the weekend at St. Joseph Church. Purchases at the Fair Trade Sale benefited farmers, artisans and laborers as they seek to build better lives for their families. “The point of this is to raise people’s awareness about what fair trade is and how we can help on a global venue. For people who are in need of jobs and fair wages and things like that in foreign countries, it’s a way to help them get out of poverty or to protect them from human trafficking, child labor, things like that, so when they’re working with these co-ops and other people that help them make these items, that’s what we’re protecting, the dignity of the worker and just a human rights issue,” said Deb Parker, event organizer. There were a wide variety of handcrafted items for sale including jewelry, clothing, home decor, keepsakes and Christmas decorations, along with coffee, tea, spices, chocolate and the famous Mother Brunner bread, baked fresh in St. Henry. “You don’t have a middleman with a co-op, so we work Catholic Relief Services who works with an organization called SERVE, and 93 percent of what is sold goes back to the co-op and then they pay the workers. They also decide what are the needs of the community because a lot of times it’s a community where the co-op is. So do we need a portion of this to go to healthcare? Do we need a portion of this to go for education or a water well? That gives them some rights too, where we’re not going in and telling them what to do with their money,” said Parker. The goods on sale at the Fair Trade Sale came from all over the world. “I know some of it’s going to Peru. There’s a couple of places in India, Kenya. We also have two people that set up tables. We have Linda Thieman, who does mission trips to Haiti, so she has a whole table of things from Haitian art from her mission trips and the people she works with down there. Then we have a twinning parish in Nicaragua, and we work with a group there called Special Families, and so those items are all made by young people and adults with disabilities,” said Parker. This was the seventh year for the Fair Trade Sale. https://www.limaohio.com/wp-content/uploads/sites/54/2018/11/web1_Fair-Trade-toned.jpgDeb Parker looks over some chocolate and coffee at the Fair Trade Sale at St. Joseph Church Parish Life Center in Wapakoneta.